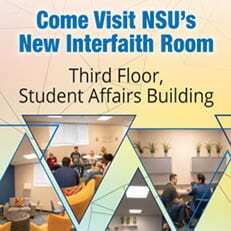 Come visit NSU’s new Interfaith room. This room allows all students to hold meetings, celebrate holidays, pray, or simply relax. The room is located on the third floor of the Student Affairs Building. To reserve the room for your meeting or event, please email interfaithroom@nova.edu.